This is a continuation of my article on Brick Veneer Siding. Now, let’s take a quick look at the economics of veneer siding. Here is the quick summary: It is cheap compared to full brick construction, but expensive compared to vinyl siding, which is about the cheapest of your siding options. In full masonry construction the biggest cost is the labor. It is skilled labor, and it is slow work. You also require a foundation underneath the bricks, which adds to the costs. Brick veneer requires somewhat less skill to apply, but it is best done by someone with lots of experience. You want the wrap and the mat and the lathe to be applied correctly to avoid problems years down the road. You want the parge coat to be nice and even, and you want the bricks to be even. These aren’t jobs done well by the first timer. With the metal grid systems you move to a situation where the labor is less, but the materials go up accordingly. You can do it yourself, or you can hire someone who does not specialize in masonry. I have put together this comparison costs per square foot for a full-width brick wall, a cavity wall (one brick wide), brick veneer siding and vinyl siding. Costs are in a range. Since it will vary a lot based on the area of the country this is only good enough to give you costs relative to each other. It shows the costs of the siding, including materials, and wrap and related materials, but not the cost of the wall being sided. In other words, I am showing just the cost of the facing , except for the brick wall, where the facing is integrated with the wall. If anyone has better feedback on what it cost them to do any of these jobs feel free to feedback with the comment form. This is intended to give you a relative idea of the costs involved. What you will get for your investment in brick is additional resale value on your home. If you sell in just a few years you will recover your investment quickly. If you stay in your house you will get the enjoyment of living in a brick home so you will recover your costs from the added satisfaction it provides. Brick veneer siding is not without its problems. Properly installed it should last for years, but what happens when everything doesn’t go right? Brick veneer siding, like stucco, is a stiff skin. It is subject to cracking if it is forced to flex too much. It can do this through a couple of mechanisms. First, the wall will expand and contract as the temperature changes. This problem is worse the longer and larger the wall. In stucco this can produce cracks in the wall running from top to bottom. A veneer of bricks responds somewhat differently. It will develop micro cracks in the mortar between the cracks. Usually these cracks will be dispersed across the breadth of the wall, so you don’t end up with one big crack and no one notices. This isn’t an unusual condition. It is normal. It does allow water in past the layer of bricks, which is why we use the mat to create a drainage path for the water. Combine this with the normal freeze-thaw cycle and you can have a situation where ice in the cracks will damage the mortar or brick. However, this is no different a condition than that experienced by normal brick walls. They last many decades, even when exposed to some nasty elements. Much will depend on the mortar used. Modern mortar, properly mixed should not cause any problem. This is what you can do with brick! The house will also expand and contract with the temperature. For almost all houses this will not present a problem, however for some types of buildings, the building is designed to allow for expansion by tying separate parts of the building together with expansion joints. This allows the separate parts to expand and contract independently of each other. This creates a problem for the brick veneer. If the building it Is attached to has an expansion joint then the siding needs a control joint. A control joint is just an engineered crack. Since the designer of the siding knows its going to crack he simply creates one in advance and fills this with a rubbery substance that closely resembles mortar. Now the sections of the wall can expand and contract and the rubber-filled crack will absorb the difference. However, this is generally not be a problem because the walls of a house are not long enough to require an expansion joint. If the lathe is not properly tied into the wall you can end up with a situation where the siding starts to pull away from the wall. This is a problem with poor construction, not a problem inherent to veneer siding. If your siding starts to do this, it Is likely that you will start losing some of your bricks. Loose bricks are the result of either of two possible conditions. One is the lathe separating from the wall, and the other is bad batch of mortar. If the former you might be able to correct the problem by drilling holes and screwing the lathe back into the wall. If the latter your best hope is to re-mortar the loose bricks and hope that it was only a small portion of the mortar that was bad. I will conclude with this note. 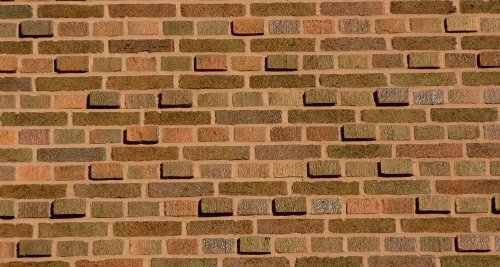 As a purist, I love a real brick wall, but I am also a realist and cheap. The truth is, a good many of the brick houses I see today have brick veneer siding and I can't even tell you which ones. So it is a good way of providing a very expensive look to your house and probably worth the extra money you will have to spend to achieve that look.